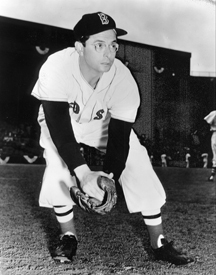 Dom DiMaggio was arguably the greatest center fielder in the history of the Boston Red Sox. During his ten full seasons with the Red Sox, Dom’s hits, runs scored and doubles compared favorably with the results of Ted Williams, Stan Musial and his brother Joe during the same period. And while Dom was an excellent hitter, he was an even better fielder: he was arguably the finest fielding center fielder of his generation. 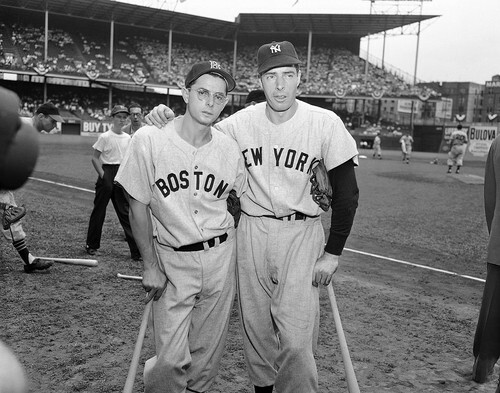 In modern times, Fred Lynn was voted the starting center fielder on the All-Fenway team and Dom DiMaggio was relegated to “first reserve.” Fred Lynn had six outstanding years with the Red Sox, but Dom’s ten full years bracketed three years of service to his country (1943-1945), and those three years came when Dom was 26 to 28 years-old, the peak of his baseball skill level. With all due respect to Fred Lynn and the All-Fenway voters, Dom DiMaggio was clearly the greatest center fielder in the history of the Boston Red Sox. “Dom DiMaggio came as close to being the perfect ballplayer as anyone I have seen in all my years of baseball,” those are the words of Red Sox icon Johnny Pesky during our 2005 interview. “He could do it all. He absolutely belongs in baseball’s Hall of Fame,” Johnny insisted. Dominic Paul DiMaggio was the youngest of nine children born to Giuseppe and Rosalie DiMaggio. His parents had emigrated to the San Francisco, California, area from Palermo, Sicily, Italy, at the turn of the century. Giuseppe DiMaggio supported his large family as a crab fisherman sailing out of historic Fisherman’s Wharf. The Bay Area was a baseball hotbed and Dom’s older brothers Mike and Tom were known as two of the finer players on the local sandlots. But their baseball careers were cut short because they were needed in the family fishing enterprise. The next DiMaggio son was Vince, who was two years older than future New York Yankee great, Joe, and four years older than Dom. Vince, who would break in with the Boston Braves in 1937, attracted the interest of the minor league San Francisco Seals and he was signed to a contract in 1932. Giuseppe DiMaggio wasn’t too keen on Vince’s choice of a career. But it was clear in Joe’s case from his earliest days on the diamond that he was destined for greatness. The elder DiMaggio gave Joe permission to pursue a baseball career, and Giuseppe quickly became Joe’s biggest fan. “My father used to wake me up at 4 a.m. when the newspaper arrived, to go over the box score with him. He would be ready to head off for a day of fishing but he couldn’t decipher the box scores and he had to know how Joe had done,” Dom remembered. Big brothers Vince and Joe had paved the way for Dom’s baseball career, but he had more than a few obstacles to overcome. Not only was he the kid brother and the smallest of the three boys, but he wore glasses. In the 1930s, professional baseball players with glasses were almost unheard of. “It was viewed as such a negative that I used to play a lot without my glasses. One day I wore my glasses and got four hits. I wore them every game after that. Dom’s first manager was Lefty O’Doul who had batted .349 over an eleven-year big league career. DiMaggio flourished under O’Doul’s tutelage and batted .306 in his first season with the Seals. The Red Sox purchased Dom’s contract from the Seals following the 1939 season, and he reported to Sarasota, Florida, to play under manager Joe Cronin in February of 1940. Dom faced the challenge of trying to break into an outfield that already included Ted Williams, and 11-year veteran Doc Cramer. His outstanding play in the Grapefruit League earned him the starting position in right field on Opening Day in Washington, DC. 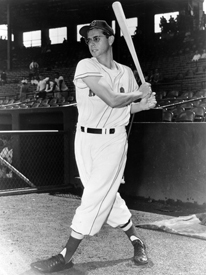 It should be noted that Dom DiMaggio is considered to be the first baseball player ever to work his way through the minors, and go on to a successful career in the major leagues wearing glasses from the beginning. A number of earlier players had donned glasses after establishing themselves in the big leagues, but in the 1940s Dom DiMaggio was a real inspiration to many aspiring major leaguers. The DiMaggio brothers: Vince, Dom & Joe during the 1986 Old-Timers’ Game at Fenway Park. The 23-year old DiMaggio immediately earned a spot as a Red Sox fixture, batting .301 in his rookie year. Early in the 1940 season, manager Cronin shifted Dom to center field to make better use of his defensive genius. His shift to center meant that three of the sixteen major league center fielders at that time shared the surname of DiMaggio. Joe led the way in 1936 with the Yankees, and in 1940 brother Vince was a regular with the Pittsburgh Pirates. The three brothers were known widely as “The Royal Family of Baseball.” Five Delahanty brothers had actually made it to the major leagues just before and immediately after the turn of the century. However, the three DiMaggio brothers were the first to each play in over 100 games in a season, a feat they sustained from 1940 through 1942. The 1941 season was a special one for Dom personally, and a very special year for baseball. On a personal level, he scored 117 runs for the Red Sox and he was selected for the American League All-Star team. In the tenth edition of the midsummer classic, played at the old Polo Grounds in New York, Dom played in the outfield alongside his brother Joe. 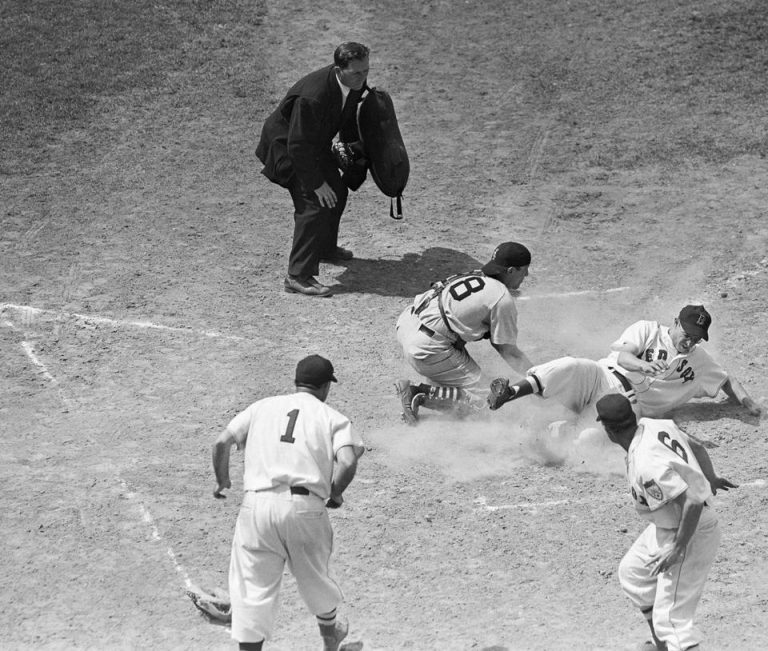 He singled in the eighth inning to drive Joe in with an important run, and watched as teammate Ted Williams won the game for the American League with a three-run homer in the ninth inning. In 1941 Dom watched with pride as his brother Joe set a major league record with base hits in 56 consecutive games. On a daily basis, he watched Ted Williams become the last major league hitter to reach .400. Dom was named to the American League All-Star team again in 1942, but major league baseball players were heading off to the Armed Forces to serve in World War II. Dom DiMaggio spent the 1943, 1944, and 1945 seasons in the U.S Navy. The 1946 season was a great one for the Boston Red Sox and for Dom DiMaggio. Dom was returned to the American League All Star team in midseason and the Red Sox clinched the American League pennant in mid-September. He played well in a losing cause in the World Series against the St. Louis Cardinals. Dom scored the winning run in the fifth game, to give the Red Sox a 3-2 two edge in the Series. Dom DiMaggio still got upset when he recalled Enos “Country” Slaughter’s mad dash for home in the eighth inning of Game Seven, and the lingering accounts that Johnny Pesky “held the ball.” He was anxious to set the record straight. “I suppose that losing the seventh game and the World Series to the St. Louis Cardinals was my biggest disappointment in baseball. But what bothers me most is the way we lost it and the bad rap that Johnny Pesky has taken all of these years. And if I hadn’t gotten hurt, I don’t think it would have turned out that way. “I had pulled a hamstring in our half of the eighth inning and Leon Culberson had to play my spot in center field. If I had been playing center field I would have shaded Harry Walker more towards left field. In fact, we were on the bench trying to get Culberson to move in that direction. And I would have charged Walker’s hit and cut it off before it got deeper in the outfield. “I would have come up firing to third base. I don’t think I would have caught Slaughter because he had such a good jump, but I think I could have held him to third. Now this isn’t a knock on Culberson, because he was a pretty good ballplayer, but I was a much better fielder than him. During the next several seasons, Dom emerged as one of the premier players in the major leagues. In 1948, he scored 127 runs as the Red Sox tied the Cleveland Indians for the pennant, losing in a one game playoff at Fenway Park. In 1949, he scored 126 runs while his team came within one game of beating the Yankees for the American League pennant. Former Red Sox first baseman Walt Dropo grew up in Mossup, Connecticut, reading about DiMaggio, Williams, and Bobby Doerr. Dropo, who died in December 2010, was named the American League Rookie of the Year in 1950 when he rapped out 144 RBI for the Red Sox, and he stood in awe of Dom’s skills. Dom DiMaggio celebrated his 33rd birthday just before reporting to spring training in 1950. Dom seemed to get better with age, putting up some of his best offensive numbers over the next three years. He led the league in triples and stolen bases in 1950. He led the American League in runs scored in both 1950 and 1951. He also continued his string of All-Star Game selections, which stretched consecutively from 1949 to 1952. In the spring of 1953 new Red Sox manager Lou Boudreau instituted a “youth movement” which significantly reduced Dom’s playing time. After considerable soul-searching, he decided to retire from baseball at the age of 36. For the first time in 17 big league seasons, there were no DiMaggio’s playing major league baseball. Dom DiMaggio’s career statistics place him in the upper echelon of baseball players for all-time. During his ten full years, he ranked first in number of hits, second in runs scored, and third in doubles [see box below] when compared to all major leaguers during this time period. He has three of the fifteen longest hitting streaks in Red Sox history. On average, he scored 105 times each season and only two Hall of Fame members from the 20th century–Lou Gehrig and brother Jolting Joe DiMaggio–averaged over 100 runs scored per season. Fielding statistics are less revealing than hitting, but he is one of only three American League outfielders to average three or more chances per game. And he is one of only five outfielders to have over 500 putouts in a season. Dom DiMaggio went from the baseball diamond to the business world without missing a beat. For many years he owned and managed a plastics manufacturing company in Lawrence, Massachusetts. His success in business mirrored his achievements in baseball. In his early years with the Red Sox, Dom returned to his native San Francisco during the off-season. That changed shortly after he married his wife Emily in 1949. “Emily is a Boston girl, so New England became home for us. I still love to go back to San Francisco but our roots are firmly planted here,” Dom said in our 2005 interview. Asked for his response to that quote, Dom answered, “My brother Joe never got to watch himself play center field.” Dom DiMaggio was a very gracious individual. Dominic DiMaggio passed away on May 8, 2009, in Marion, MA at the age of 92. He is buried in Newton Cemetery in Newton, MA. Dom DiMaggio was the first baseball player this writer ever saw, and my first baseball hero. When I got to interview Dom and to spend time with him over the years, I was pleased to learn that I had chosen my hero wisely. Great story on a truly great player and even better person. I believe Dom was one of the original investors in the “Boson Patriots”, not positive but I think so. You are 100% correct Dan about Dom and the Patriots. And you are 100% correct about what a great guy Dom was. Tex Houston, Ellis Kinder, Mel Parnell, and Mickey McDermott. The one constant was always Dom DiMaggio. He was always consistent and dependable every day. I marvelled how he glided after fly balls and base hits in the outfield. He was one of my heros.